Murdoch University's Acting Vice Chancellor, Andrew Taggart, joined a student #LetThemStay action on March 3 after controversial actions by university administration the previous week. A secene from the peoples' power' uprising that ousted the US-backed Marcos dictatorship 30 years ago. The EDSA Uprising of February 25, 1986, overthrew the Philippine's brutal US-backed dictatorship of Ferdinand Marcos. The uprising was named after the Manila thoroughfare where events unfolded. It is often known as “EDSA 1” to distinguish it from later uprisings that occurred in EDSA. Rallies were held around the world on February 23 outside of Apple stores to back the manufacturer in resisting FBI attempts to create an iPhone “backdoor” to allow authorities to access protected information. Demonstrations were organised in about 30 cities, including several US, spearheaded by the internet rights group Fight for the Future. “People are rallying at Apple stores because what the FBI is demanding here will make all of us less safe, not more safe,” said Fight for the Future’s Evan Greer. 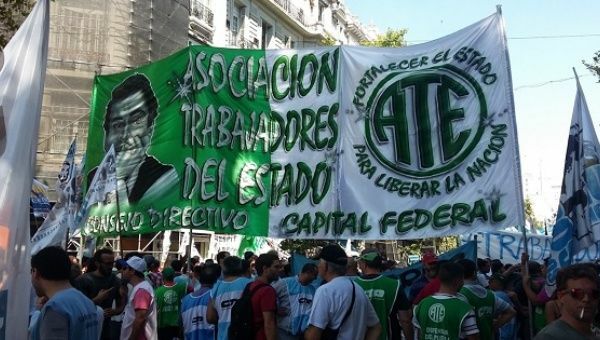 Thousands of Argentine public sector workers took to the streets of Buenos Aires and convened at the presidential palace on February 24 as part of a national strike to protest the huge layoffs of state workers by the administration of new right-wing President Mauricio Macri. On February 27, hundreds of people rallied in Melbourne to let refugees stay and close the prison camps. The action was in response to a visit by Prime Minister Malcolm Turnbull and Opposition leader Bill Shorten with people chanting "let them stay" at both. The action was called by Refugee Action Collective and First Nations Liberation. Heavy handed police assaulted protesters attempting to approach the stage. The Premier Daniel Andrews has called on Turnbull to let the 267 refugees stay in Australia rather than be sent to Nauru. The article below is abridged from an editorial in ML Update, published by the Communist Party of India (Marxist-Leninist) Liberation.